In an effort to highlight places of interest in countries across the world, their varied culture, economy and history, The Statesman brings to you a Weekly Focus on countries with which India shares diplomatic ties and friendship. This week’s focus is on Bolivia. Know all about the country. Religion: Roman Catholic 76.8 per cent, Evangelical and Pentecostal 8.1, Protestant 7.9, other 1.7, none 5.5 (2012 est.) Ethnic groups: Mestizo (mixed white and Amerindian ancestry) 68 per cent, indigenous 20, white 5, other 7; 44 per cent of respondents indicated feeling part of some indigenous group, predominantly Quechua or Aymara (2009 est.). Climate: Bolivia has a temperate climate but temperatures can differ dramatically between day and night. The wettest period is November to March, which, in extreme circumstances, may induce landslides in mountainous areas, and cause certain roads to become impassable. The northeast slopes of the Andes are semi-tropical. Winter is perhaps the best time to visit (May/October), especially in the hot and humid lowlands, as it is cooler and drier. In the highlands, it rains much less, remains sunny through the day but gets noticeably colder at night. Salar de Uyuni: Largest salt flat in the world: The expanse of salt creates an unending white landscape during the dry season, but the area is most breathtaking in the rainy season when it is covered in water. The reflection of the blue sky creates a spectacular and surreal landscape. Some of the top attractions are Train cemetery, Uyuni Isla Incahuasi, Uyuni Eduardo AvaroaAndean Fauna National Reserve, Uyuni Laguna Verde Green Lagoon and Uyuni Laguna Colorada Red Lagoon. 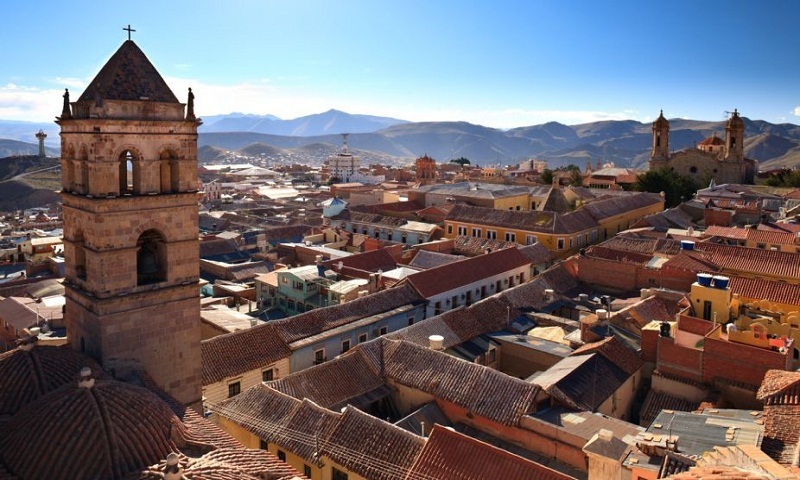 La Paz: Administrative capital of Bolivia: Situated on steep hills at an elevation of roughly 3,650 m above sea level, highest de facto capital city in the world. Main attractions are Plaza Murillo, The Witches Market and the San Francisco Cathedral. Tiwanaku: This World Heritage Site is an ancient pre-Columbian city in ruins near the south-eastern shore of Lake Titicaca. The city was built with stones weighing more than 25 tonne from the other side of the lake. Main highlights are The Akapana pyramid (largest building in Tiwanaku, Pumapunku or Puma Punku, The Gate of the Sun (Puertadel Sol) and The Kalasaya. Other attractions are Lake Titicaca (largest lake in South America), Potosi (one of the world’s highest cities, that once housed over 60,000 tonnes of silver), Yungas Road(mountain bikers) and Madidi National Park.